Umoi Melo de Souza was born on June 28, 1964 in the city of Goiânia, but lived most of his life in Brasília, the capital city of Brazil. He started training Capoeira at the age of 10 in Sobradinho, a city in the suburbs of Brasilia, with Mestre Cordeiro’s Grupo Dos Irmãos Unidos. He also trained with Mestre Mão de Ouro who taught him Capoeira Angola. Mestre Cordeiro eventually stopped teaching, prompting Umoi to practice with Grupo de Capoeira Kabala. This group was a sort of a meeting point of established capoeiristas and because Umoi was very young in capoeira as well as in age, the Kabala members were reluctant to accept him at first. Over time, however, he integrated into the group and made some lifelong friendships. Some names that Umoi holds dear are: Louro, Carlão, Paulão, Mizael, Futica, Cristiano, Nenen, Periquito, Gavião, Haroldo, Kamano, Cascavel, Beto, Carlinho Cabeludo, among others. 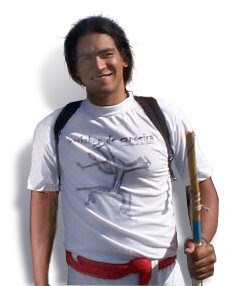 After five years of Capoeira practice, Umoi, with two other friends, Bené and Mariô, created the group Beumar Capoeira. With the assistance of Mestre Risadinha, Mestre Kall, Mestre Alcides and some Kabala veterans amongst others, they were able to gather a great number of students. Eventually Umoi and his two co-founders went separate ways, dismantling their group. Around this time, Umoi ran into Mestre Alcides who “adopted” him, taught him and granted him the purple (Contra Mestre) and red (Mestre) cordas. 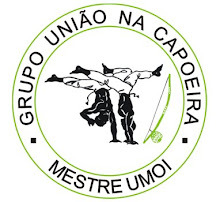 Umoi recognizes that a lot of people were and still are very instrumental to his growth in Capoeira, however there are two individuals that he considers to be the most significant: his first Mestre, Cordeiro and his current Mestre, Alcides. Along with these two Mestres, Umoi can name a legion of people who also played a key role in his Capoeira development, including Cordeiro, Mão-de-Ouro, Jacinto, Nenen, Louro, Paulão, Mizael, Carlão, Beto, Leonã, Mariô, Bené, Nilsão, Chibata, Futica, Carlinho-Cabeludo, Adilson, Tabosa, Squisito, Kall, Risadinha, Pesado, Pombo-de-Ouro, Maya, Godoy, Farol e Alcides.